Vegan food, no fur allowed | Mmm, Tasty! 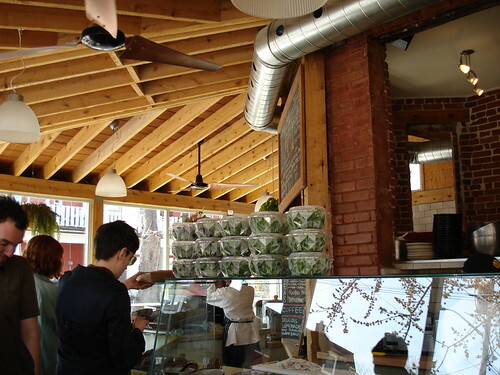 Urban Herbivore is one of my favourite lunch spots in Toronto. I’m not going to wax poetic about the virtues of eating vegan; after all, I’m a vegetarian who went back to eating fish and chicken for a few years before turning back to veggie-dom. 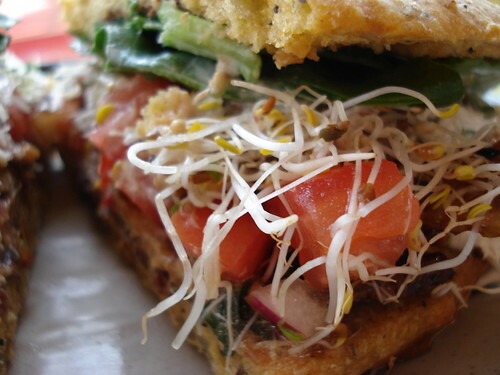 But I do really like the sandwiches at Herbivore. My favourite is their chimichurri, which I had for lunch on my birthday. Sadly, on my most recent visit, which I wrote about for FoodTV.ca, they were out of wheat gluten, so I had to settle for my second favourite, sesame tempeh. Urban Herbivore is the sister restaurant to Fressen, which we loved but had some service issues at. Not surprisingly, there are some minor service issues at Herbivore too, mostly in that orders can get mixed up between the time you order and pay and the time you receive your food. They’re always quick to fix the problem, so it’s not a huge deal, but it is one of those things I notice. I think it’s simply an issue of having too few staff taking orders, or being too disorganized for the number of people coming through the door. Their no fur policy, which is displayed right on their door, is interesting to me. On the one hand, fur is definitely the most controversial animal product that people can wear, and vegans certainly tend to be anti-fur. On the other hand, fur isn’t ok, but leather or down is? Hmm. Maybe it’s an enforcement issue – down and leather can be hard to avoid, especially during the colder months, but fur really isn’t. Or maybe they’re trying to make a statement specifically about fur. Either way, best leave your bunny mittens at home if you’re going to go to Urban Herbivore, if you’re the type that would wear such a thing. For details on the food, check out my foodtv.ca review.